What weapons are you packing? Inspired by the "What spells are you packing?" thread, I thought I would ask what most people use as their main weapon. I think that a choice of weapon sometimes adds "flavor" to a character concept. Phyllick uses a "Dwarf's Pride" Warhammer (+4 Str/Con) w/ crystals applied. It's an upgrade from the base +1 Morningstar (later /w crystals & enh. bonus) he used during his first run through Aenea. I've noticed the Club and Spear are more popular these days - Karamip uses the Impaler as well. Re: What weapons are you packing? Audrey uses the Luminaria. Nuttin' says Paladin like a greatsword cleaving off the heads of bad guys. Gorekhan Vosh: Greataxe baby! An orc barbarian *must* have! Tenar "Hawkeye" Tallorin: Composite Longbow. Zoran Van Zastrell: Dual Kukris. 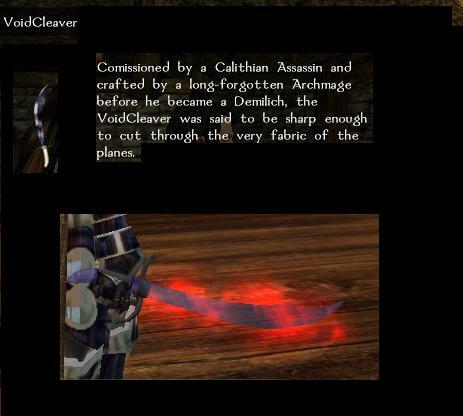 Aszhad Rahshid: The scimitar of Doom, The VoidCleaver. I like the scimitar's name. Beuttlerian Gauntlets of Awesomeness...If you know Bram you know why I say that. My Beasty-orc fighter/acrobat has grown fond of a 2-bladed sword. For simplicity, it's a great weapon for duel-wielding since a mage only has to cast a weapon buffing spell on you once, yet both main and offhand attacks benefit. Kukirs, 80% of my chars. Derfel - Formerly a scimitar and a tower shield, now a greatsword. Wyrm's Fall, specifically, all crystalled up, until I make a custom. Kasigi - Fully crystalled katana and wakizashi, or else partially crystalled Diamond-Clawed Gloves. No expert in the many weapons Aenea has to offer, but I found a handaxe with Bludgeon dmg and vampiric regen +3 and Greater Magic Weapon spell to be a very nice item to have when swallowed by a Purple Worm.